where to find solid wood breakfast bars such as that one? really like the solid wood breakfast bar. How is that mounted onto the countertop? Where to buy wood at this size? Thank you, we love it too! It is a 90mm bulthaup b3 bar in walnut and is available for purchase as part of a bulthaup kitchen. 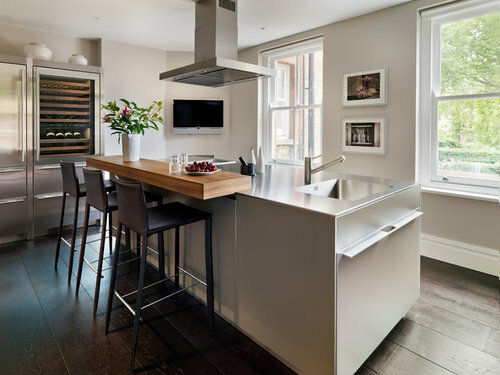 We have a team of specialist bulthaup fitters who install all Kitchen Architecture's kitchens. Wood breakfast bar on quartz worktop? Osmo Top Oil for breakfast bar - which finish? Look at this unique illuminated breakfast bar!